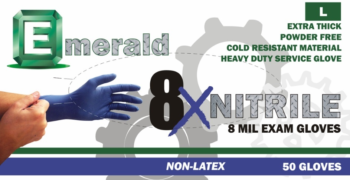 Emerald 8X Nitrile gloves are made with a non-latex formula and 8 mil thickness for greater protection. Extremely durable and tear-resistant, these gloves provide superior chemical resistance while also providing outstanding tactile sensitivity. 12″ length. Packaging: 50 gloves per dispenser box. 10 boxes per case. XXL 48 gloves per box. All Emerald disposable examination gloves meet FDA 510(k) standards as Class 1 Medical Devices. In addition, their components are in compliance with the Federal Food, Drug and Cosmetics Act provisions which allow their repeated use in direct contact with food.